An on-the-job injury may result in permanent disability, but the combination of a patient who is motivated to return to work and a good medical team can provide the foundation for success. Return to work is attributed not only to the doctors involved, but also to the knowledgeable nurse case managers navigating their patients to success and a cooperative patient. Here we discuss the case of a remarkable young man who was injured while working for a landscaping firm. LS, an 18-year-old man was injured at a landscaping job site in June 2012. 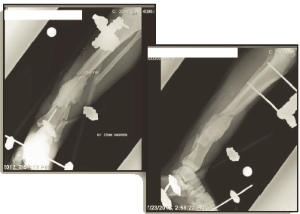 A forklift fell onto his left leg and he sustained a grade III-B open tibia-fibula fracture with severe comminution and contamination. His initial debridement and external fixation took place at a local trauma center. Shortly thereafter, he was transferred to The Denver Clinic for Extremities at Risk (DCER) at Presbyterian/ St. Luke’s Medical Center (P/SL) through the DCER emergency replant service (fig 1). Upon arrival to P/SL, LS was evaluated by orthopedic surgeon, Dr. Ron Hugate. Upon examination, Dr. Hugate identified three main issues: 1. deep infection inside of the wound; 2. bony deficits; and 3. soft tissue injury requiring reconstruction. He discussed each of these challenges with LS and his family while detailing a realistic evaluation of potential outcomes - a 50% chance of success and a 50% chance that LS would lose his limb. Following his evaluation, Dr. Hugate performed an aggressive irrigation and debridement, transposed the fibula, inserted antibiotic beads, placed a wound vac, and reassembled the original external fixator. At this time, Dr. Hugate debrided the flexor hallucis longus muscle belly, the peroneus brevis, and the tibialis anterior muscle belly and tendon due to necrosis. Dr. Hugate was concerned about the blood flow to the lower leg therefore he consulted vascular surgeon Dr. Omar Mubarak, MD. Dr. Mubarak performed an arteriogram two days later to explore the blood flow to the injured limb. He found that the posterior tibial artery remained intact to the ankle. However, the other two leg arteries were not functional. Dr. Hugate next consulted plastic surgeon Dr. David Schnur regarding the soft tissue injury. Dr. Schnur determined that the best approach to address the soft tissue deficit was to utilize a rectus abdominus free flap. However, the extent of vascular damage presented a challenge - only one of the three arteries to the leg was intact- and required that the surgery be performed with concurrent management of the patient’s vascular issues. After consultation with the DCER team, Dr. Mubarak and Dr. Schnur took LS back to surgery. Dr. Mubarak harvested the right greater saphenous vein and bypassed from the popliteal artery to the rectus abdominus flap that Dr. Schnur had harvested and placed along the anterior wound. For venous outflow, Dr. Mubarak exposed the left greater saphenous vein for end-to-end anastomosis with the deep inferior epigastric vein of the flap. Additionally, Dr. Schnur performed a debridement, filled the 12cm tibial bone deficit with an antibiotic cement spacer and placed a skin graft. After closure, the external fixator was reapplied. Later that day, LS developed a venous thrombosis leaving the flap congested which Dr. Schnur repaired successfully. Orthopedic surgeon Dr. David Hahn first saw LS on July 23, 2012, approximately 6 weeks post-injury. X-rays at this time revealed a 12 cm bone deficit in the mid to distal 1/3 of the tibia (fig 2). The free flap was intact and there was about 1/3 functional vasculature in the foot. Despite the decreased circulation, LS’s foot remained quite functional. Upon examination, Dr. Hahn presented LS with four treatment options to treat the tibial deficit: 1) free vascularized bone flap; 2) allograft; 3) bone transport; or 4) amputation. Due to the large bone deficit on a significant weight bearing bone and a history of infection, Dr. Hahn strongly recommended bone transport or amputation over the other two options. LS and his family decided bone transport was the best option for him even though this meant that he would miss one semester of college at his out-of-state university. At this time, the treatment plan was also discussed with Anna Ver Hage, RN, nurse case manager. On August 28, 2012, Dr. Hahn removed previous hardware, performed a double level corticotomy in the tibia and placed a Taylor Spatial Frame to begin the arduous process of bone transport. Cultures from this surgery grew out P. acnes, and LS began IV antibiotics under the treatment of infectious disease specialists Dr. Matthew Terra. LS was compliant with the bone transport process and progressed nicely with very few complications. In December 2012, approximately five months after the bone transport began, Dr. Hahn noticed premature consolidation of the proximal corticotomy and brought LS back to surgery for a corticotomy revision. Cultures from this procedure grew out S. lugudunensis which was treated by Dr. Terra with six weeks IV daptomycin and oral fluconazole. In January 2013, LS resumed college. He remained compliant with his bone transport protocol and kept in contact with Catherine Patrick, RN, another nurse case manager who maintained excellent communication between LS and the treatment team throughout his treatment (fig 3). 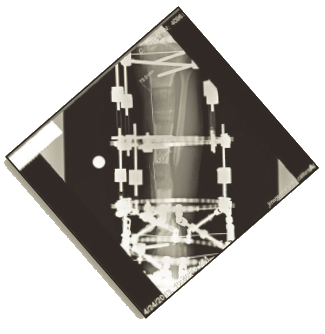 LS continued to progress with few complications, and on October 21, 2013, after 15 months of bone transport, his frame was removed (fig 4). He was placed in a boot and began physical therapy. 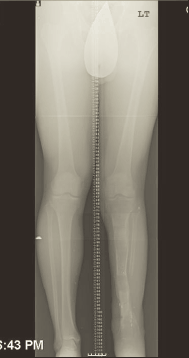 He had a slight valgus deformity in his left lower leg, however Dr. Hahn felt that this would not be a problem. At one month post frame removal, LS was swimming and riding an exercise bicycle. Currently, LS is eight months post frame removal and reports a Lower Extremity Functional Scale score of 59% (Brinkley et al., 1999) and his pain at 4/10. He states he is continuing to improve, and is grateful to have his leg. Traumatic on-the job injuries can be complex to treat. One of the most important components to returning an injured worker to work is communication between the treatment team, patient and the nurse case managers. For the treatment team, it is important to give realistic evaluations of success and to ensure the patient’s long term goals (return to work vs. permanent disability) are reflected in the treatment plan. The multi-disciplinary expertise offered by the Denver Clinic for Extremities at Risk team enables us to effectively treat complex problems. Our abilities to communicate quickly, operate collaboratively and address unique issues as they arise, facilitate superior outcomes and high patient satisfaction.